I was craving for durians late at night and went to check out one of the “posher” durian stalls near my place. It’s called Kota Durian Red Carpet, named for the red carpets on the floor, I presume. 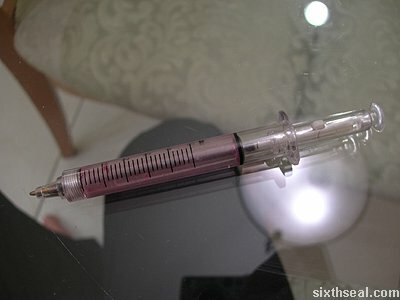 I’ve actually been here with my better half before but we didn’t see anything interesting (besides the dubious A24 and B24 durians, which they claim are better grades of D24). However, this time I spotted a HUGE durian among the pile labelled as “Durian Pahang Sang Lee”. Sang Lee is a place near Raub, Pahang which is famous for their durians. These were selling for RM 12/kg and are supposedly durian kampong. 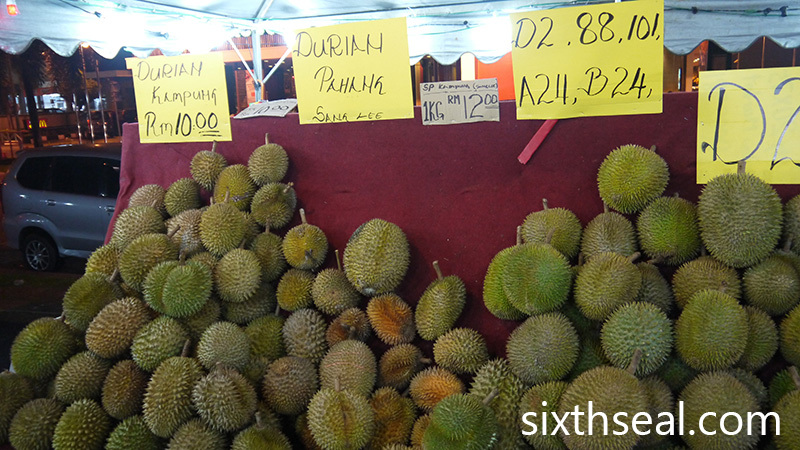 It’s slightly more expensive than the RM 10/kg regular durian kampong in the other mound. 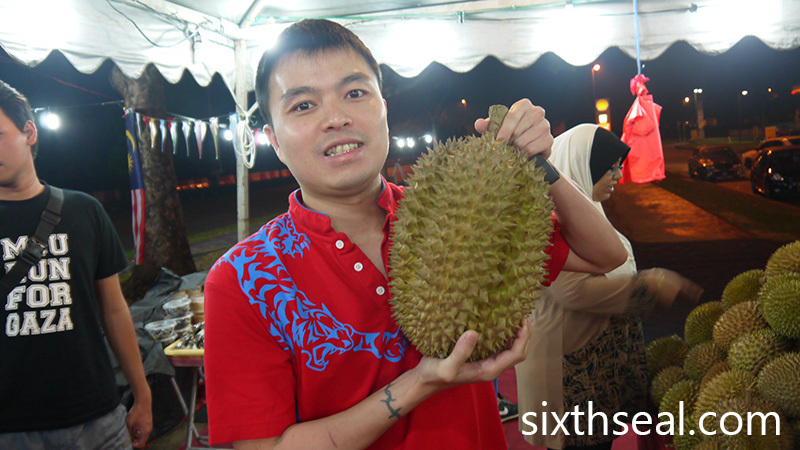 I was quite surprised at the size of the durian – it weighed in at a staggering 5.4 kg! 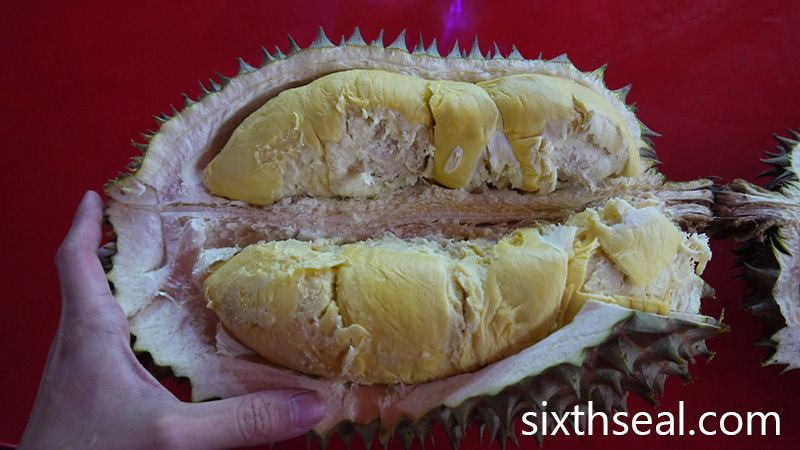 That comes up to RM 65 for the durian, but since it was almost 1 am, I managed to convince them to let it go at RM 40. 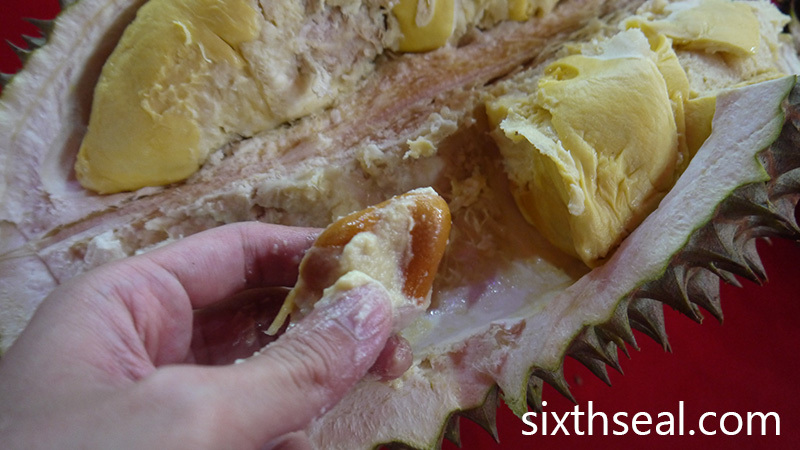 The durian was opened up and I saw the flesh was reasonably decent, although in such a gigantic durian, there’s bound to be irregularities. I suspect this durian is really a D159/Monthong/Bantal Emas that has been chucked into the pile since Monthong Durians generally don’t sell well in the local market. Yup, that makes it the bigger brother of the frozen durians you’ll find in Asian groceries abroad – Monthong has less odor and the flesh is inoffensive to first-timers. However, this isn’t a pure bred Thailand Monthong durian but the D159 Golden Pillow cultivar planted locally which is a colossal 4-6 kg beast. 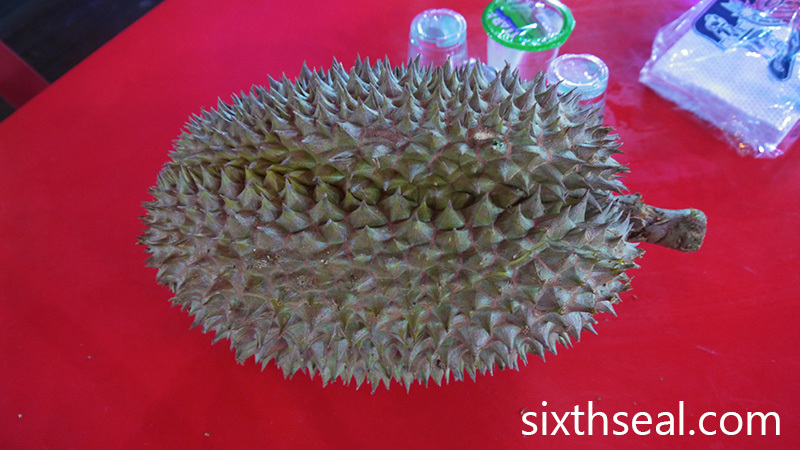 The 5.4 kg durian had so much flesh that I found that I could only eat two rows before I was full to the point of being stuffed! 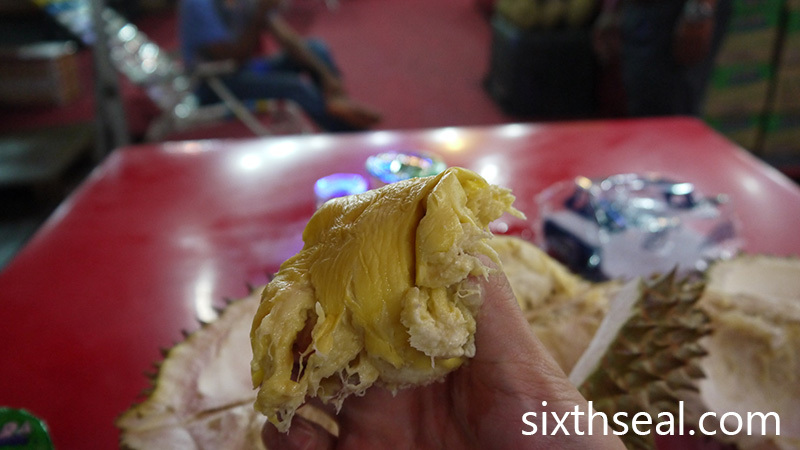 It took me 24 hours to finish the entire durian – eating it for every single meal. The flesh was sweet but mostly tasteless – fluffy like a soft marshmallow (it’s almost like eating foam) and very filling since the seeds are quite small.